We are proud to provide a video brochure solution that excels above the competition. Our advantage is that we offer a competitive pricing structure as well as advocating a strong client relationship. This produces a bespoke video brochure designed to maximise your brand effectiveness. But what does bespoke mean in the context of video brochure marketing? What do we offer that allows us to proudly stand behind every brochure we make? We bring our clients into focus. Their mission, goals and objectives are what matters to us and with our bespoke video brochures we encapsulate what our clients do and who they are. Our success derives from the success of our clients. A video brochure is not completely comparable to a standard paper brochure. They are a portable interactive experience that can be supplied with your product. However, the impact of your video brochures intertwine with your branding strategy, which is why we work closely with your marketing department, your content production department and your design team. If you are without any of these departments and you are keen on a bespoke video brochure, our own graphic design team has extensive experience with website design and branding. Not only are they well versed in modern design practices, they know how to give your video brochure personality and play to your brand’s unique strengths. We can recommend the perfect brochure size to match your content, the perfect design to amplify your brand’s image and the perfect quantity to ensure no prospective customer is left empty handed. Giving you brand personality in the Healthcare Industry can be tough sometimes due to its clinic nature. Video brochures are the perfect tool to keep the clinic touch branded with a personal note. Did you know that video brochures are the leading marketing tool on the market? Their popularity in recent years have arisen due to their affordability and a contemporary shift in customer behaviour. 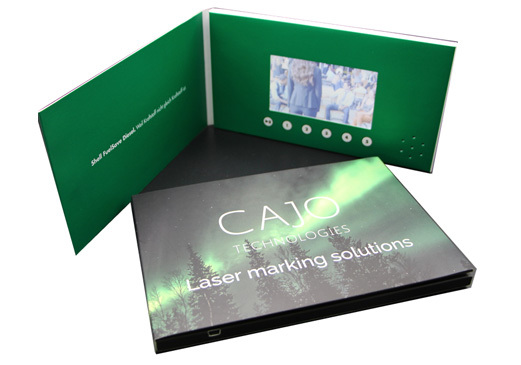 Video brochure affordability is mainly due to the price drop of LCD video screens, which made the integrated video screen suitable for traditional print brochures. Furthermore, LCD screens are efficient, slim, and able to produce a picture quality that was not viable for large-scale production 5 years ago. This means that LCD video screens are unequivocally the ideal video screen for a bespoke video brochure. Combined with a brochure design, they form the basis to create a brochure that can engage customer attention in a way that standard print brochures could only dream of in this decade. 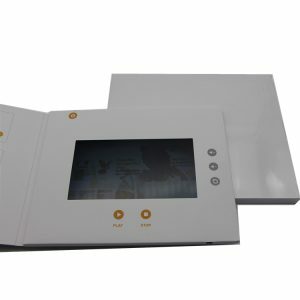 One of the notable features of video brochures is that they operate without any internet connection or wires. 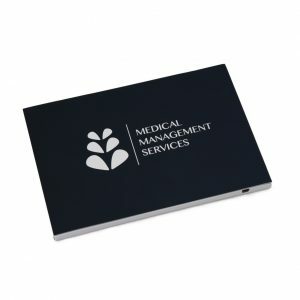 We deliver your bespoke brochure fully charged and are delivered with an USB cable. If needed, they can be recharged by you for reuse in multi-day conferences or by your customer, if they so wish to introduce the power of video brochures to colleagues and family. Last but not least, no software updates are necessary to keep the brochures updated. Every brochure we deliver is tested for quality and the software extensively tested for guaranteed satisfaction by you. The result? Video Brochures with video screen that are incredibly easy to use. Just open the brochure and the video will auto play. Easy! Interested in video brochures for your next marketing campaign? Try our pricing calculator below and discover what we can offer!